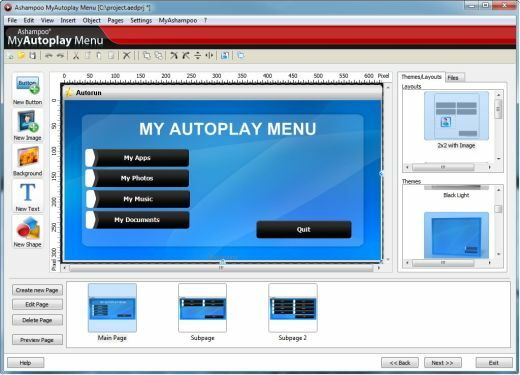 Ashampoo MyAutoplay Menu takes all the work out of building autoplay discs with a simple point-and-click interface. And it includes CD and DVD burning so that you can create your finished discs without leaving the program. Use for: Multimedia discs with navigation menus, demo and incentive discs, portable application collections on thumb drives, unusual gifts and more. When you insert a commercial program disc it will often start automatically with a graphical menu that lets you make choices like installing a program, displaying a web page, viewing documentation or information material and so on. Building these discs and menus manually is a lot of work and requires programming skills – and even if you have the skills it takes a long time. Ashampoo MyAutoplay Menu takes all the work out of building autoplay discs with a simple point-and-click interface. And it includes CD and DVD burning so that you can create your finished discs without leaving the program.